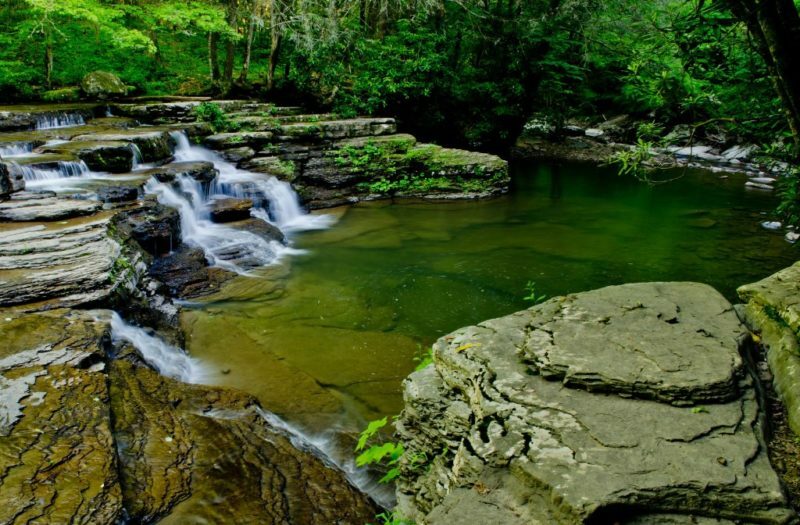 Falls on Camp Creek, one of more than 200 rivers and streams in West Virginia stocked with trout. Photo Rick Burgess. The W.Va. Division of Natural Resources manages trout stocking at more than 200 rivers and streams and more than 70 lakes and ponds in West Virginia. Trout stocking rivers and stocking patterns may change, and an updated listed is available through division website. For updated stocking information, call the W.Va. Hunting & Fishing Hotline at (304) 558-3399. Anthony Creek, in Greenbrier County, is stocked once in January, once in February, and once weekly March through May, then again during the week of Columbus Day and again a week later. Back Fork of Elk River, in Webster County, is stocked monthly, February through May. Back Fork of Elk River (catch-and-release), in Webster County, is stocked variably. Beech Fork Lake tailwaters, in Wayne County, are stocked monthly, February through May. Big Bullskin Run, in Jefferson County, is stocked once in January, once in February, and once weekly March through May. Big Clear Creek, in Greenbrier County, is stocked once in February and once every two weeks in March, April, and May. Big Sandy Creek, in Preston County, is stocked once in February and once every two weeks in March, April, and May. Blackwater River, in Tucker County, is stocked once in January, once in February, and once weekly March through May, then again during the week of Columbus Day and again a week later. Blackwater River (catch-and-release), in Tucker County, is stocked variably. Buckhannon River, in Upshur County, is stocked once in February and once every two weeks in March, April, and May. Buffalo Creek, in Brooke County, is stocked once in February and once every two weeks in March, April, and May. Buffalo Creek, in Logan County, is stocked monthly, February through May. Burnsville Lake tailwaters, in Braxton County, is stocked once in February and once every two weeks in March, April, and May. Camp Creek, in Mercer County, is stocked once in February and once every two weeks in March, April, and May. Cherry River, in Nicholas County, is stocked once in February and once every two weeks in March, April, and May. Clear Fork, in McDowell County, is stocked monthly, February through May. Clear Fork, in Wyoming County, is stocked once in February and once every two weeks in March, April, and May. Clear Fork (catch-and-release), in Wyoming County, is stocked variably. Clover Run, in Tucker County, is stocked monthly, February through May. Cranberry River, in Nicholas, Pocahontas, Webster counties, is stocked once in January, once in February, and weekly March through May, then again during the week of Columbus Day and again a week later. Cranberry River (catch-and-release), in Nicholas and Pocahontas counties, is stocked variably. Cranberry River (Woodbine area) in Nicholas County, is stocked during the first week of March. Deer Creek, in Nicholas County, is stocked monthly, February through May. Deer Creek, in Pocahontas County, is stocked monthly, February through May. Desert Fork, in Webster County, is stocked monthly, February through May. Dillions Run, in Hampshire County, is stocked once in February and once every two weeks in March, April, and May. Dry Fork, in McDowell County, is stocked monthly, February through May. Dry Fork, in Randolph and Tucker counties, is stocked once in February and once every two weeks in March, April, and May. Dunloup Creek, in Fayette County, is stocked monthly, February through May. East Fork of the Greenbrier River, in Pocahontas County, is stocked once in January, once in February, and once weekly March through May. East Lynn Lake tailwaters, in Wayne County, is stocked monthly, February through May. East River, in Mercer County, is stocked once in February and once every two weeks in March, April, and May. Edwards Run, in Hampshire County, is stocked once in February and once every two weeks in March, April, and May. Elk River, in Webster and Randolph counties, is stocked once in January, once in February, and once weekly March through May, then again during the week of Columbus Day and again a week later. Elk River (catch-and-release), in Randolph County, is stocked variably. Elkwater Fork, in Randolph County, is stocked monthly, February through May. Evitts Run, in Jefferson County, is stocked once in January, once in February, and once weekly March through May, then again during the week of Columbus Day and again a week later. Fall Run, in Webster County, is stocked monthly, February through May. Gandy Creek, in Randolph County, is stocked once in January, once in February, and once weekly March through May. Glade Creek, at Babcock State Park, in Fayette County, is stocked once in February and once every two weeks in March, April, and May. Glade Creek, in Raleigh County, is stocked once in February and once every two weeks in March, April, and May. Glady Fork, in Randolph County, is stocked once in January, once in February, and once weekly March through May. Greenbrier River, in Pocahontas County, is stocked once in February and once every two weeks in March, April, and May. Hills Creek, in Pocahontas County, is stocked monthly, February through May. Hopkins Fork, in Boone County, is stocked monthly, February through May. Horseshoe Run, in Tucker County, is stocked once in February and once every two weeks in March, April, and May. Indian Creek, in Summers County, is stocked monthly, February through May. Kings Creek, in Hancock County, is stocked monthly, February through May. Knapps Creek, in Pocahontas County, is stocked once in January, once in February, and once weekly March through May, then again during the week of Columbus Day and again a week later. Laurel Creek, in Fayette County, is stocked monthly, February through May. Laurel Creek, in Greenbrier and Nicholas counties, is stocked monthly, February through May. Laurel Fork, in Randolph County, is stocked once in January, once in February, and once weekly March through May. Laurel Fork, in Webster County, is stocked once in February and once every two weeks in March, April, and May. Left Fork of Buckhannon River, in Upshur County, is stocked monthly, February through May. Left Fork of Holly River, in Webster County, is stocked once in February and once every two weeks in March, April, and May. Left Fork of the Right Fork of the Buckhannon River, in Randolph and Upshur counties, is stocked once in February and once every two weeks in March, April, and May. Little Clear Creek, in Greenbrier County, is stocked once in February and once every two weeks in March, April, and May. Little Kanawha River in Lewis and Upshur counties, is stocked monthly, February through May. Little River (East Fork), in Pocahontas County, is stocked once in January, once in February, and once weekly March through May. Little River (West Fork), in Pocahontas County, is stocked once in January, once in February, and once weekly March through May. Long Marsh Run, in Jefferson County, is stocked monthly, February through May. Lost River, in Hardy County, is stocked once in January, once in February, and once weekly March through May, then again during the week of Columbus Day and again a week later. Lower Cove Run, in Hardy County, is stocked monthly, February through May. Marsh Fork, in Raleigh County, is stocked monthly, February through May. Mash Fork, in Mercer County, is stocked once in February and once every two weeks in March, April, and May. Meadow Creek, in Greenbrier County, is stocked monthly, February through May. Meadow Creek, in Summers County, is stocked monthly, February through May. Middle Creek, in Berkeley County, is stocked once in January, once in February, and once weekly March through May. Middle Fork, in Upshur, Barbour, and Randolph counties, is stocked monthly, February through May. Middle Wheeling Creek (catch-and-release), in Ohio County, is stocked variably. Mill Creek, in Fayette County, is stocked monthly, February through May. Mill Creek, in Berkeley County, is stocked once in January, once in February, and once weekly March through May. Mill Creek, in Hampshire County, is stocked once in February and once every two weeks in March, April, and May. Milligan Creek, in Greenbrier County, is stocked monthly, February through May. Mill Run, in Berkeley County, is stocked monthly, February through May. Mill Run, in Hampshire County, is stocked once in February and once every two weeks in March, April, and May. Moores Run, in Hardy County, is stocked monthly, February through May. New Creek, in Mineral County, is stocked once in January, once in February, and once weekly March through May. North Branch of Potomac River, in Mineral County, is stocked monthly, February through May. North River, in Hardy County, is stocked once in February and once every two weeks in March, April, and May. North Fork of Anthony Creek, in Greenbrier County, is stocked once in February and once every two weeks in March, April, and May. North Fork of Cherry River, in Greenbrier and Nicholas counties, is stocked once in February and once every two weeks in March, April, and May. North Fork of Fishing Creek, in Wetzel County, is stocked monthly, February through May. North Fork of Lunice Creek, in Grant County, is stocked once in February and once every two weeks in March, April, and May. North Fork of Patterson Creek, in Grant County, is stocked once in January, once in February, and once weekly March through May. North Fork of South Branch, in Grant and Pendleton counties, is stocked once in January, once in February, and weekly March through May, then again during the week of Columbus Day and again a week later. North Fork of South Branch (catch-and-release), in Pendleton County, is stocked variably. Opequon Creek, in Berkeley and Jefferson counties, is stocked once in January, once in February, and once weekly March through May, then again during the week of Columbus Day and again a week later. Paint Creek, in Fayette and Kanawha counties, is stocked once in February and once every two weeks in March, April, and May. Paint Creek (catch-and-release), in Fayette County, is stocked variably. Panther Creek, in McDowell County, is stocked monthly, February through May. Paw Paw Creek, in Marion County, is stocked once in February and once every two weeks in March, April, and May. Pinch Creek, in Raleigh County, is stocked in April. Pinnacle Creek, in Wyoming County, is stocked once in February and once every two weeks in March, April, and May. Pond Fork, in Boone County, is stocked once in February and once every two weeks in March, April, and May. Potts Creek, in Monroe County, is stocked monthly, February through May. R.D. Bailey Lake tailwaters, in Mingo and Wyoming counties, is stocked once in February and once every two weeks in March, April, and May. Red Creek, in Tucker County, is stocked once in February and once every two weeks in March, April, and May. Rhine Creek, in Preston County, is stocked monthly, February through May. Rich Creek, in Monroe County, is stocked monthly, February through May. Right Fork of Buckhannon River, in Upshur County, is stocked monthly, February through May. Right Fork of Middle Fork, in Upshur County, is stocked monthly, February through May. Right Fork of Little Kanawha River, in Upshur and Webster counties, is stocked monthly, February through May. Rocky Marsh Run, in Jefferson County, is stocked once in January, once in February, and once weekly March through May. Second Creek (catch-and-release), in Monroe and Greenbrier counties, is stocked variably. Shavers Fork (catch-and-release), in Randolph County, is stocked variably. Shavers Fork (lower section), in Randolph County, is stocked once in January, once in February, and once weekly March through May, then again during the week of Columbus Day and again a week later. Shavers Fork (upper section), in Randolph County, is stocked once in January, once in February, and once weekly March through May, then again during the week of Columbus Day and again a week later. South Branch (Franklin section), in Pendleton County, is stocked once in January, once in February, and once weekly March through May, then again during the week of Columbus Day and again a week later. South Branch (Smoke Hole section), in Pendleton County, is stocked once in January, once in February, and weekly March through May, then again during the week of Columbus Day and again a week later. South Branch (catch-and-release), in Pendleton County, is stocked variably. South Fork of Cherry River, in Greenbrier and Nicholas counties, is stocked once in February and once every two weeks in March, April, and May. South Fork of Cranberry River, in Pocahontas County, is stocked once in February and once every two weeks in March, April, and May. South Fork of Fishing Creek, in Wetzel County, is stocked monthly, February through May. South Fork of Potts Creek, in Monroe County, is stocked monthly, February through May. Spruce Laurel Fork, in Boone County, is stocked monthly, February through May. Stonewall Jackson Lake tailwaters, in Lewis County, are stocked once in February and once every two weeks in March, April, and May. Sugar Creek, in Webster County, is stocked monthly, February through May. Summersville Lake tailwaters , in Nicholas County, are stocked once in February and once every two weeks in March, April, and May. Sutton Lake tailwaters, in Braxton County, are stocked once in February and once every two weeks in March, April, and May. Tilhance Creek, in Berkeley County, is stocked once in February and once every two weeks in March, April, and May. Tomlinson Run, in Hancock County, is stocked monthly, February through May. Trout Run, in Hardy County, is stocked once in January, once in February, and once weekly March through May. Tuscarora Creek, in Berkeley County, is stocked once in February and once every two weeks in March, April, and May. Twelvepole Creek at Wayne Dam, in Wayne County, is stocked monthly, January through April. Tygart Lake tailwaters, in Taylor County, is stocked monthly, February through May, then again the week of Columbus Day and again a week later. Tygart Valley River headwaters, in Randolph County, are stocked once in February and once every two weeks in March, April, and May. Waites Run, in Hardy County, is stocked once in January, once in February, and once weekly March through May. West Fork of Greenbrier River, in Pocahontas County, is stocked once in January, once in February, and once weekly March through May, then again during the week of Columbus Day and again a week later. West Fork of Twelvepole Creek, in Wayne County, is stocked monthly, February through May. Wheeling Creek, in Marshall and Ohio counties, is stocked once in February and once every two weeks in March, April, and May. Whiteday Creek, in Marion and Monongalia counties, is stocked once in February and once every two weeks in March, April, and May. Williams River, in Webster and Pocahontas counties, is stocked once in January, once in February, and once weekly March through May, then again during the week of Columbus Day and again a week later. Wolf Creek, in Preston County, is stocked monthly, February through May. The above information is based on that provided by the W.Va. Division of Natural Resources in its 2012 Guide to Fishing Regulations available in PDF format. Help us report on trout stocking rivers and streams. Trout stocking at lakes and ponds is subject to change annually in West Virginia. Please help us ensure our content is accurate by reporting any changes to a member of our editorial staff.